David T. Smith is an internationally recognized gin expert, he is the author of four books on gin, and writes the gin blog Summer Fruit Cup. Smith also serves as a lead judge for the International Wine and Spirits Competition, and as the lead steward for the ADI Judging of Craft Spirits. Most recently Smith has helped create the world's first independent gin bottler, That Boutique-y Gin Company, which works with gin distillers around the world to offer unique and creative expressions of gin not seen before. 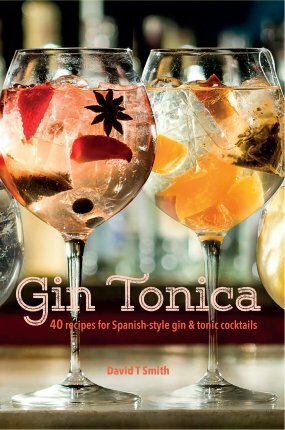 His latest book, Gin Tonica: 40 Recipes for Spanish-style Gin and Tonic Cocktails is a brief and informative guide to the incredible creativity and wide ranges of flavors possible in Spanish-style gin and tonics. While the gin and tonic is most closely associated with England and the former British Empire in India, the G&T has be warmly embraced in Spain and transformed into a unique and tantalizing drinking experience. From Spain, it the Gin Tonica returned to the UK and more recently has started to pop up around the United States. As in introduction to this novel way of preparing and serving a gin and tonic, Smith breaks the book down into four basic sections. Sections one and two are separated based on the style of gin being used, either classic or contemporary gin. And, sections tree and four are differentiated by types of garnish that can be use, which Smith describes as experimental and seasonal. While it is common for a distiller to promote his or her gin by serving it in a gin and tonic, the Gin Tonica provides an interesting alternative. Take for example Smith's Late Breakfast Gin Tonica. This cocktail features FEW Spirits' Breakfast Gin which includes bergamot and Earl Grey tea in the botanical mix. Smith includes a teaspoon of marmalade and a dried orange slice to garnish the drink which adds sweetness and plays well with the signature botanicals. Rather than offering a regular G&T, gin distillers can expand their creativity beyond their botanical mix and think about ways to highlight any unique or signature botanicals used in their gin by offering Gin Tonicas that use complementary and colorful garnishes. Gins that standout can sometimes make it harder for your average consumer to know how to use the spirit. Gin Tonicas, like those demonstrated in Smith's book offer a new way to present gins to the drinking public that are enticing and designed to complement the base spirit.